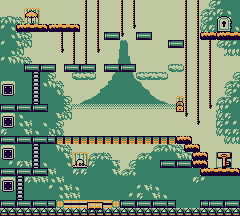 Stage 4-6 is the sixth level in the Jungle in Game Boy version of Donkey Kong. The level introduces Sand Blocks. Mario starts on a platform above some spikes. He must head left and jump over a gap which has spikes in it, then walk over to the left, then wait for a moving platform to get close enough to him in order to jump on and ride over to the other side. Then Mario must climb up two ladders and head right over some Sand Blocks while jumping so he leaves some blocks in case slip-ups occur. Mario must then make it over to the key and grab it, then go down through a hole he left from the sand blocks. There's a platform connected to other blocks above the other platforms which he can land on. Mario must go back to the ladders where he must toss the key, then climb the ladders. On the third platform he must throw the key up to the higher platform, then Handstand Jump up to the platform to get back to the key. Then he must activate the Block and put the key in the hole between the first and second platforms to get the Snipers off the first platform so they are not in his way; he can also activate the block and put it between the second and third platforms at the right time to get the Snipers on the third platform. Then Mario must climb the ladder and watch out for a Dorakyū while he tosses the key up to the higher platform, then quickly climbs across and up the vines over to the platform with the key to get it back. Then Mario must head right and make some jumps over some gaps to get across the platforms to the door to end the level. Hat: In midair above the Spikes. Parasol: On a high platform to the left. Bag: Next to the vines. This page was last edited on September 7, 2018, at 03:11.